In my opinion, the moment most characteristic of Swindle’s debut Deep Medi album is the point at the beginning of “Pledge Allegiance” where a disembodied, heavily edited voice repeats the album’s title over and over again. The pitch-shifted synthesizer, nasally quick guitar chords, and dubstep-styled bass all contribute to the image the album’s title attempts to create. 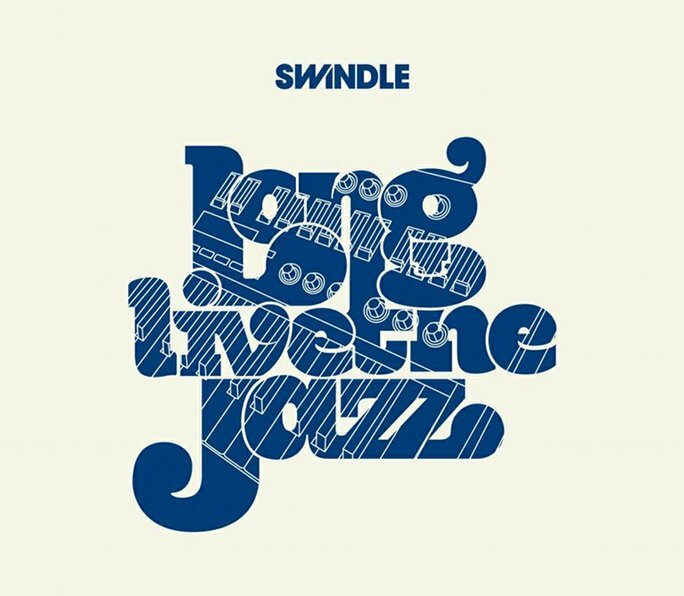 On Long Live The Jazz, Swindle demonstrates that “the jazz” is very much alive, but in a much different form than the genre’s pioneers must have imagined over the course of its formation at the turn of the 20th century. Rather than upright bass and baby grand plunking out a tune behind a woman scatting in stunning dress and furs at a swanky club or backroom, its new form (in Swindle’s mind at least) takes place in a modern recording studio, every instrument a product of a MIDI keyboard and a copy of Pro Tools, and a packed club, the crowd in baggy T-shirts and cargo pants, high out of their minds, jamming to the sounds coming out of a DJ’s equipment. Forgive me for the hyperbole here, but Long Live The Jazz is what dubstep should sound like. Rather than confine himself to the tropes prevalent in much of today’s “post-’06-step” which arguably stifle the creativity once found in the style, Swindle fuses said tropes with his own mastery of the keys and knowledge of jazz composition. Call it a gimmick, if you wish – after all, the idea of “hey, let’s fuse X genre with Y style and see how many copies we can sell” has been unfortunately popular over the past few years, and equally as unfortunately it tends to work. However, what makes it seem less gimmicky and more whatever the opposite of “gimmicky” is – “heartfelt,” “true” or “legitimate,” maybe – is how organic the whole thing feels. As much as we all know how much Swindle must have slaved over the album for hours and hours in the studio, perfecting every tap of the hi-hat, it’s surprisingly believable that the producer instead recorded everything live in one take. It has a live feel, an image that is carefully constructed to feel as though it were improvised and created on the spot and is all the better because of it. Take “Kick It,” for example. The various hand claps, the tight snare rolls, and plucked upright bass contrast starkly with the brutal sub-bass and resounding snare hits of Swindle’s counterparts on label Deep Medi. And, whereas much of the label’s material ends up fading together due to very similar sounds and styles, Swindle stands out thanks to his attention to keeping his own individual sound as well as the sounds of the jazz he loves so much. Whether he’s weaving together languid, twisted vocals and drawn-out brass sections on “When I Fly Away” or matching Terri Walker’s sultry jazz-queen voice with a nasally, wavering synth lead on “Running Cold,” Swindle always takes pains to ensure his sound is his own, full of big-band swagger and poise. In a recent review for Disclosure’s Settle, Sputnikmusic user Ben Thornburgh complained that it “feel[s] like we’re being fed gimmicks.” Though he was referring specifically to the so-called “EDM revolution” in America, the same can be said about the quote-unquote “serious” dubstep popular in Swindle’s home country of England, which often sees creativity and innovation eschewed in favor of big bass and big drums. Fortunately, Swindle’s fusion of classic jazz sounds and modern dubstep ideas is very much fresh and as far from a gimmick as can be. The album’s cover in conjunction with its title is appropriate, then. As the title is “Long Live The Jazz,” the jazz lives on. The synthesizer which makes up the letters in the title shows how much different jazz’s new form is – no longer a fully organic, live-instrument based experience, Swindle’s version of “the jazz” is very intentionally produced. However, if Long Live The Jazz is any indication, jazz couldn’t be healthier – the creative spirit that fueled its rise in the first place is still alive.